Image | This entry was posted in Uncategorized and tagged Armistice Day, Commemoration of WW1, Photography, Remembrance. Bookmark the permalink. I think the silhouettes are touching. If I’m ‘reading’ them aright, there’s a sailor, an airman, and an infantryman. It’s creative, and unusual. 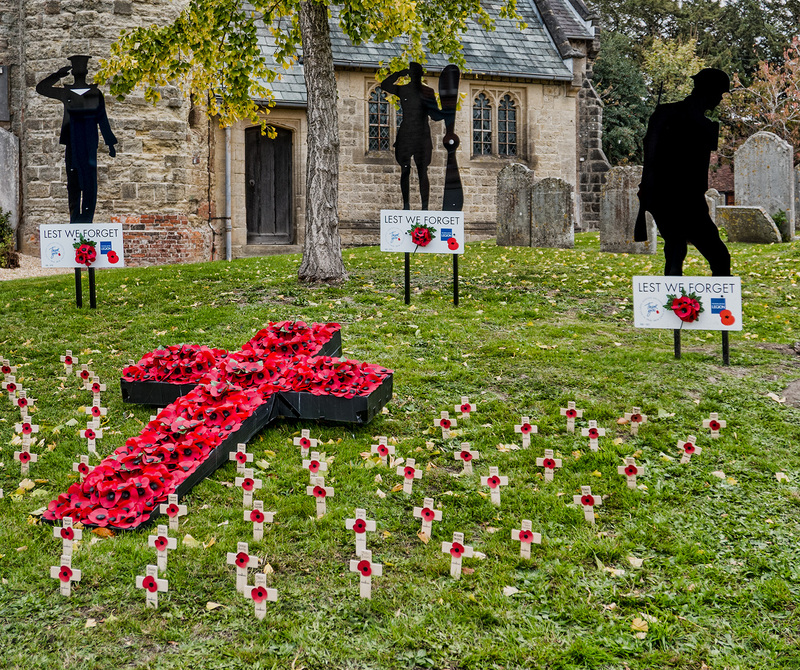 These near life-size figures have been part of the commemoration in the UK of 100 years since the end of WW1. The foot soldier, a ‘Tommy’ has been a frequent sight in towns and villages, the sailor and airman not so frequent. This is the only time I have seen the three of them together and it seemed a very apt image for November 11. A well-captured image of a moving scene tribute, Andy. Less some might think we American’s are as uncouth as our current president, we remember them with honor here also. Thanks very much Earl. You must, I am sure, cringe at some of your President’s tweets and his behaviour. He doesn’t understand the word ‘Presidential’. I strong remembrance of what we human beings are able to inflict of pain and atrocities. Yes, let’s never forget.